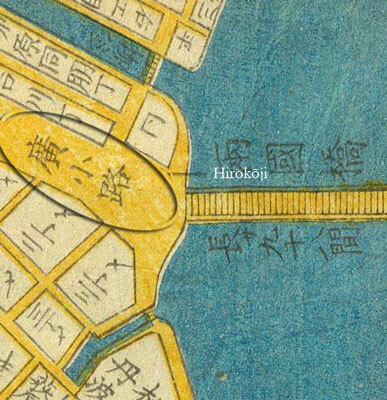 Across the Sumida on the east bank the blue roofed shōgun’s boat sheds arise. 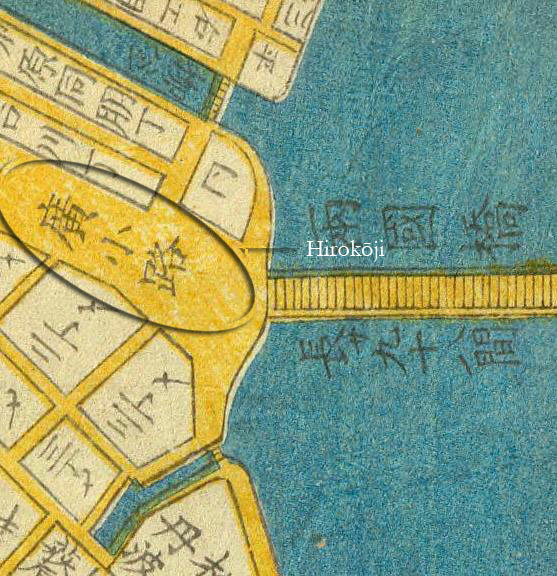 In the foreground, in the main street of Hirokōji (廣小路, which literally translates into “spacious lane” or “broad way”) - and following the details of the image from right to left - we first see the north end of Moto Yanagi bridge and then the willow after which it was named. 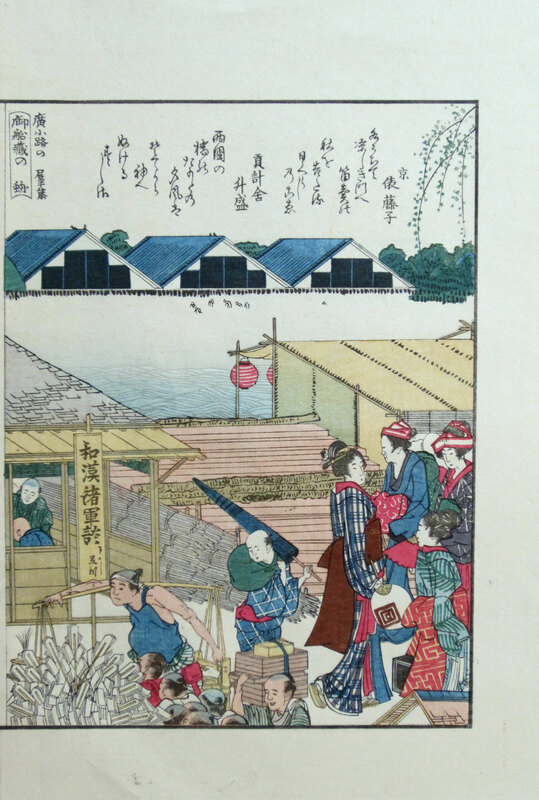 Continuing next from right to left we see four priests in print 1-13, a low-ranked samurai holding a parcel wrapped in a cloth (called a furoshiki), and a man carrying a basket full of small watermelons. 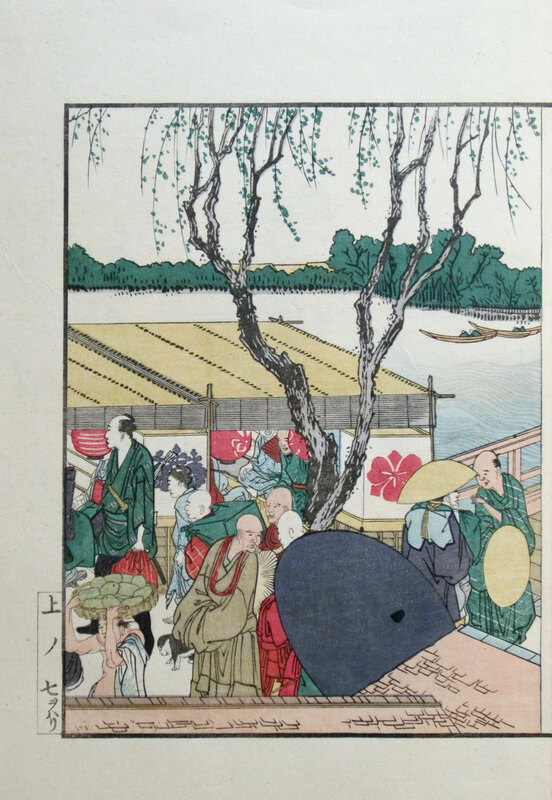 On the right of print 1-14 a lady is holding a fan with a drawing of three red concentric squares, suggesting that she admires the kabuki actor Ichikawa Danjurō VII. 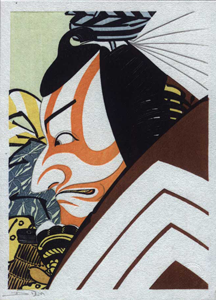 The three concentric squares are the family crest of the Ichikawa family, the most famous family of kabuki actors who were called “Danjurō” once considered ready and able to perform professionally. 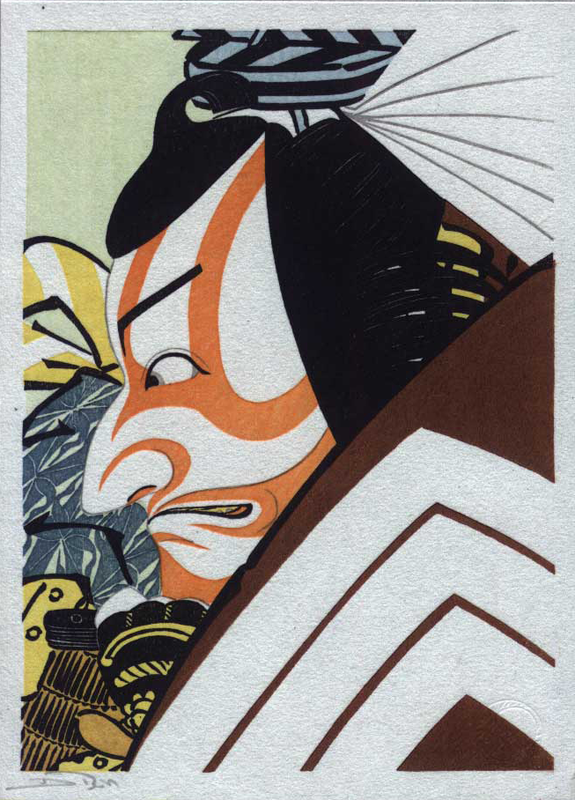 Around 1800 Danjurō VII was the lead kabuki actor in Edo and here is one of the prints in which this actor has been immortalised (a reproduction made by David Bull). At the time this print was designed, which was 1796, Danjurō VII was still called Ichikawa Ebizo. 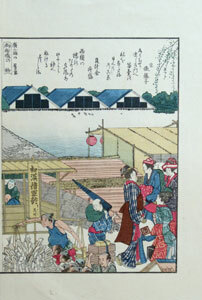 Finally, on the left of print 2-14 a man is seen carrying a basket full of gohei (御幣, which literally translates into “honorable Shintō zigzag-paper offerings”). Gohei are wooden wands decorated with two shide (zigzag-shaped paper streamers, see prints 3-12 and 3-13 for details) used in Shintō rituals. Across the river people are harvesting shells in the low water in front of the boat sheds.